(Tulsa, Okla.) October 29, 2015 – SMG Tulsa, the management company of both BOK Center and Cox Business Center, was named as one of the 35 Top Inclusive Workplace Cultures by Mosaic, the Tulsa Regional Chamber’s diversity business council, at the third-annual Economic Inclusion Forum on Thursday morning. The companies and organizations were recognized for their commitment to diversity through Mosaic’s five key metrics: diverse suppliers, diverse people, internal policies, CEO commitment and community outreach programs. Companies and organizations honored represent over 39,000 employees in our region and state from 49 industries, and achieved a three, four or five-star ranking based on results from Mosaic’s annual Diversity Survey. 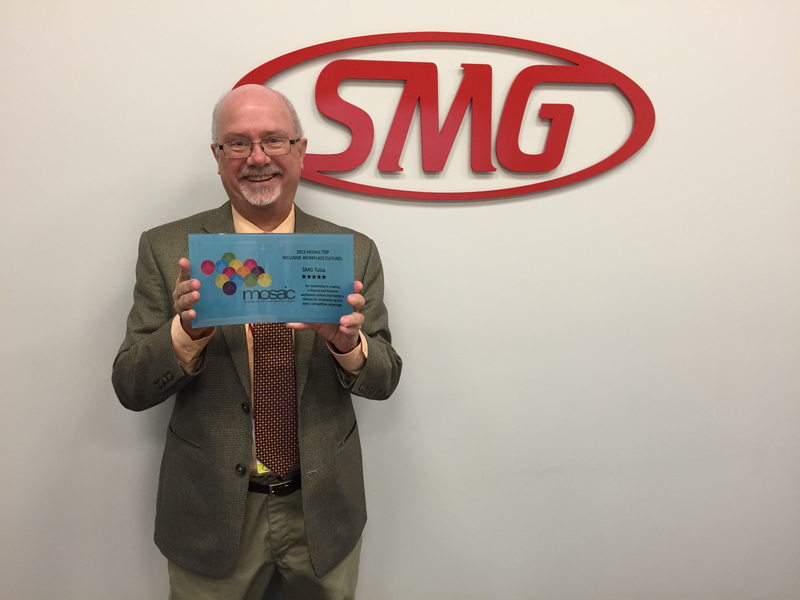 SMG Tulsa was one of 20 organizations that received a five-star ranking. The primary focus of the Mosaic council is to create awareness about the competitive advantage of having a diverse and inclusive business climate in our region. Mosaic seeks to leverage the region’s diversity to improve perceptions of our community and grow the economy. Ultimately, Mosaic wishes to catapult the Tulsa region into the forefront of diversity and inclusion through talent recruitment initiatives and business retention and expansion efforts. “We’re honored to be recognized for our commitment to a diversified workplace. This award is a testament to our diligence in seeking out a workforce that mirrors the Tulsa community,” said SMG Tulsa General Manager Jeff Nickler. The complete list of 2015 Top Inclusive Workplace Culture winners can be found at www.tulsachamber.com.